24 Hours Luxury Minibus and Taxi service in Bolton, Lancashire and UK offering private tours, airport pickups and drop-offers covering all major UK Airports and corporate hires. Complete our easy to use online booking facility to book a minibus or taxi now. We can provide you with an efficient, reliable service, 24 hours a day, 365 days a year. 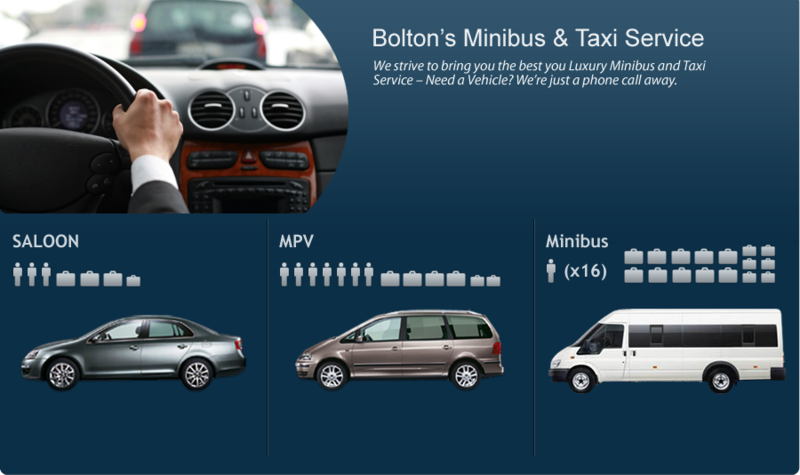 Atlas minibuses is one of Bolton’s minibus and taxi service. Atlas Minibuses covers all of Bolton, and Lancashire but also has regular customers from outside the area. We offer a range of services from routine private hire runs to contract hire for weddings, football matches, airport transfers to Manchester, Liverpool and Leeds Bradford, parcel delivery, school journeys, with our range of cars and mini-buses. All of our drivers receive comprehensive training, ensuring the customer experience is always consistent. We understand the value of your time and ensure that your pickup arrives ontime, every time. We have a mixed fleet of vehicles comprising of Saloon, Estate and Minibus available for groups of 5 to 16 passengers. The Minibus is a good choice if you need extra room for bulky items that may not fit into a saloon. Our minicab service is available 24 hours a day, 365 days a year, with courteous staff always available to assist with your transport needs whether minicab trips within Lancashire or journeys outside the Northwest including all UK Airports. In accordance with the new legislation, all our vehicles are non smoking. Call all your 'journey' needs, please call us on 07951 795 453 or make a booking using our booking form. We accommodate for all types of travel. Pickups from all major airports including Manchester, Liverpool and Blackpool. Dropoffs from all airports including Manchester, Liverpool, Blackpoo and Heathrow. We now offer a range of Corporate Executive Travel services.